Agile software development has quickly proven its value in delivering high-quality applications that meet customer needs. Ouriken agile developers produce superior code that is easier to maintain, adapt and extend. Our agile development practices, such as frequent deliveries, continuous integration, and build, deployment, and test automation, reduce risk and rework. We support you by recommending agile methods for adoption and for outsourcing. We work with you to choose platforms, tools and metrics that increase visibility and predictability along the way. We also create playbooks, share best practices and tailor processes to” be” agile, not just “do” agile. At Ouriken, we’re not Agile purists; we’re Agile realists. We fit our framework to our customer’s needs, not our customer’s needs to our framework. This customer-first mentality was the driving force behind the creation of our own Agile framework which blends SAFe, LeSS, Scrum, Extreme Programming, and Kanban. This blend allows us to be flexible without sacrificing the guiding principles of Agile. We’ve leveraged the Ouriken Agile Framework successfully internally in high-performing pods to deliver exceptional business value and externally to help our clients grow in their Agile journey. Agile Transformation isn’t easy. Ouriken's agile coaches help your organisation with a SAFe Program consultants to scale Agile across the organisation as well as with a Certified Scrum Coach for a single pod. Our coaches can offer a multidimensional analysis of an organization’s Agile maturity, along with a clear roadmap to enhance and expedite the Agile journey. From one-off projects to total enterprise transformations, Ouriken expertly meets our clients’ needs. 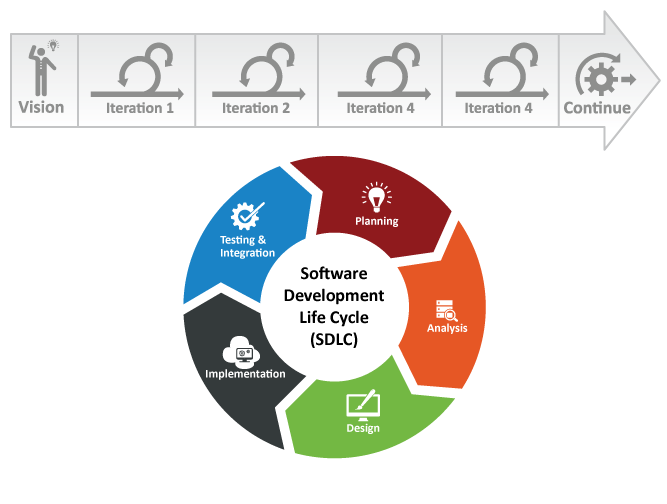 Continuous Delivery Transformation optimizes the system desgin along with development, automated testing and operatioons. This is done by removing traditional silos and embedding new strategic vision instead. This new vision prioritizes collaboration and agility in order to release high-value software into the market as quickly as possible, helping clients keep pace with changing customer needs, rapidly evolving technologies, and dynamic markets. Generally digital projects take greater collaboration and hence they are subject to tighter delivery timelines. We develop user personas and rapid prototypes, adhering to Lean UI/ UX principles that allow for working software to be demoed at the end of every two-week sprint. Then we take it to the streets to conduct “Guerilla Testing” with actual end users. By the time we hand over the completed project, we can say with absolute certainty that our clients and their customers are going to love it! We know clients don’t want to wait several months to get the information they need today. That’s why we shorten that time significantly by focusing on developing the architectural ramp necessary to support the required report or dashboard. This is accelerated data structure development. It enables shifts that make changing businesses require minimal rework. The Agile Analytics Framework delivers high-value reports and dashboards at the completion of every two-week sprint. The result is earlier adoption, greater client acceptance, and greatly reduced time-to-market. At Ouriken, we’re not Agile purists; we’re Agile realists. Our expertise covers all of the industry-leading frameworks: Scrum, Extreme Programming (XP), Kanban, Large Scale Scrum (LeSS), and the Scaled Agile Framework (SAFe). This allows Ouriken to tailor our approach to meet the specific needs of our clients.